Just got back today from what I call Musky Fest. It is really a focused two-day fishing trip up to the Presque Isle, WI area for a stab at boating a musky or two. 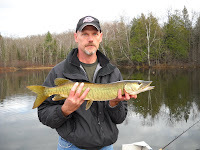 We had OK success this year in that we landed two musky in our boat and one rogue northern pike. The Musky were small, I got a 26" and Steve managed to get a 36" Tiger Musky that was a nice looking fish. Both were caught and released unharmed, to live another day. The northern I caught yesterday was a 25" and was more of a nuisance than anything. There was a day when I wouldn't be calling any 25" fish a nuisance, but when you're fishing for Musky, anything less is a pain. It was a great weekend weather-wise. (Great for standing in, not great for catching fish.) It was about 63 and cloudless on Sat. and the same and cloudy on Fri. A beautiful October so far, that just keeps on going. Ben's team won their last football game on Saturday, and I heard he did very well. He and another player chased down a runner on a breakaway run and almost made a touchdown saving tackle. It sounded like a good game. They won 14-6. He makes me so proud. He did tell Donna that he was sad when they were handing in the equipment. He said he'd miss football and all the new friends he'd made. I think that he's finally liking it because he likes it, not because I want him to play. It's good he's built a bit of passion for the game. Heard some funny and crazy stories while I was up north this weekend. One of the funnier ones was by a shop owner who said every once in a while you see a truck and boat trailer roaring by that has blown out a trailer tire, unbeknownst to the driver and has worn the tire right down to the rim. It'd be driving by and sparks would be flying, driver clueless to it all. Funny stuff. Otherwise, nothing much is new. Sarah finishes up volleyball tomorrow with a tournament at Arrowhead that should be fun to watch. They're playing three teams and she can't wait until it's over. I have to giver her credit, she finished out the year. Good for her. Much more catching up to do in other areas at the moment, so I'll be...blogging off.